This Newsletter's tip is a quick one: They don't call them MOTION pictures for nothing. Film is a dynamic visual medium, and the eye is instinctively drawn to motion. 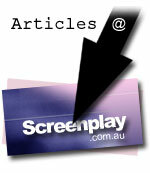 When writing for the screen, be sure to add motion to your screenplay. Not by describing camera movements (bad screenwriter! ), but by giving your words a sense of action. The most straightforward way to do this is by using specific nouns and action verbs. For example "The house is sitting on top of the hill" is a static, boring, dull sentence. There's no motion in that. No action. No sense of movement. Try "The mansion looms atop Deadman's Hill." House is generic; mansion is specific. Is sitting is static; looms is dynamic. The hill has no character -- until it's Deadman's. The sharper the picture you create in the mind of the reader, the more dynamic their experience will be. Don't let your pictures stand still!